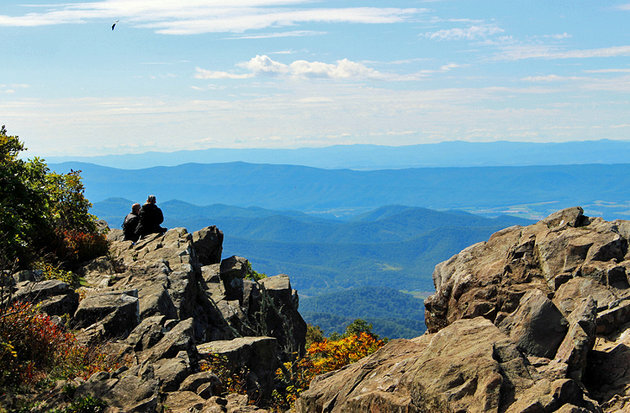 There are over 500 miles of hiking trails in Shenandoah National Park. The trails vary in length from short-stretchers to a 101 mile segment of the Appalachian Trail that runs the length of the park. Many of the trailheads are located on Skyline Drive and in the developed areas. The Whiteoak Canyon Trail leads to six waterfalls and an old-growth forest. As you walk through foothill grasses, a tick may hitch a ride. Tick bites are painless, but a small percentage of ticks carry Lyme disease. If you have been hiking in brushy or grassy areas, check yourself thoroughly when you return from your hike. Use tick repellent to all clothing, including footwear, according to label instructions. Tuck shirts into pants and pants into socks. If you find a tick, remove it with tweezers and seek a ranger’s or doctor’s advice. Wash the area thoroughly with soap and water. There are seven picnic areas. Tables, fireplaces, drinking fountains and restrooms are provided.